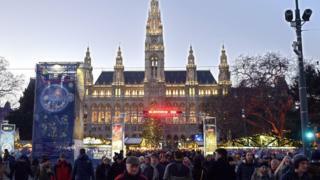 Austria's interior minister says the arrest of a man in the capital Vienna has averted a possible terror attack in the city. Wolfgang Sobotka said the 18-year-old was an Austrian citizen of a migrant background and there were "indications" of jihadist motives. Police are warning the public to be alert and to report suspicious objects. The arrest took place at about 17:00 GMT on Friday when special forces raided an apartment. Mr Sobotka said the man had been under observation for several days. "Our police forces managed in quick time to arrest a suspect and so prevent a potential terror attack in the federal capital Vienna," he told reporters. "The decisive leads came from foreign intelligence services." Mr Sobotka said possible links to Islamic extremist were being investigated. "There are individual indications [of extremism] that we have to investigate. There is one contact that is pretty clear and there are several indications that will be looked at intensively," he said. Mr Sobotka declined to give any further details. A report by the Austrian newspaper Krone said a group of Islamist militants of Albanian background had planned an attack in Vienna this month. It did not specify its sources. In the wake of the arrest, police are increasing security in Vienna, a spokeswoman told AFP news agency. Last year, Austria charged two men in connection with the 2015 Paris attacks that killed 130 people. The men, who had been arrested at a refugee shelter in Salzburg, were later extradited to France. In 2014, a 14-year-old boy was convicted of terrorism offences in Austria, including a plot to bomb a Vienna railway station.